Andy was born in 1945. 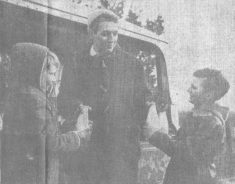 He came to Harston in 1960 with his father Frederick, who was a widower at the time, and they lived at No 49 High Street where they ran a dairy business. Andy worked there until 1971 and after 1975, working for the estate agents Cheffin, Grain & Chalk in between. In 1971 Andy purchased Nos 6 & 8 Green Man Lane, a pair of cottages which were in desperate need of renovation. He married Anne in 1976 and lived in No 6 (now combined with 8) Green Man Lane after the completion of the renovations. In 1977 Andy and Anne purchased the dairy business from Andrew’s father, Frederick, and they moved into No 49 High Street while Frederick, now re-married, moved at the same time into No 6 Green Man Lane; he later sold this to a Mr Simon Ford and moved to Bournemouth where he lived until his death in 1994. In 1989, Andy sold No 49 High Street then bought and moved into No 57 High Street, officially ‘Lincoln House’. After selling the dairy business in 1996 he went to work for the Royal Mail as a postman in Harlton and Eversden. This originated at Baggot Hall Farm where Mr Hays had a dairy herd. He bottled their milk and sold it retail from the Farm. In 1956 he sold the retail bottle dairy business to Mr Rushbrooke who then lived and ran the business from No 49 High Street until 1959. Mr Rushbrooke sold No 49 and the dairy business to Mr Manning, a WWII R.A.F. pilot, who had them for just one year. He lacked experience and the business was near bankruptcy. Andy’s dad, Frederick already had experience in the dairy business and had moved from London back to Devon when his wife died when Andy was 10. Frederick was looking to buy a business so when it came up for sale in Harston they moved here. He bought both No 49, then called Commerce House, and the dairy business from Mr Manning in 1960. Andrew was 13 when they moved and never returned to school after the move here and no-one noticed he should have been at school. Andy bought No 49 and the business from his father in 1977 but in 1989 moved to No 57 High Street Harston taking the retail bottle dairy business with him. Because there was no cold store at No 57 he bought a refrigerated lorry which he parked there to use as his cold store. He used the open fronted barn (now behind No 59 High Street) as a garage for his delivery vehicles. Andrew sold the dairy business to Plumb & Webb of Balsham in 1996 as a going concern. In 1971 Andy purchased Nos 6 & 8 Green Man Lane from Mr & Mrs Howe. They also owned land and orchards behind, some of the land on which their grandson John Ives later built his bungalow. Mr & Mrs Howe worked for Chivers Orchards and also owned Penn Farm, Haslingfield. No 6 & 8 Green Man Lane were originally 4 terrace cottages, Nos 2, 4, 6 & 8. In 1971, Nos 2 & 4 had already been incorporated into No 6; No 8 had a sitting tenant, Mr Eligh Northrop, who had been the village “roadman” keeping the verges neat (along with Mr Malling), until his retirement and who died 6 months after Andy’s purchase. A previous occupant (possibly Robert Tuck) used to be visited by George Topham who would help him with his correspondence as he couldn’t read or write. The occupant did however, have lots of gold sovereigns in the bottom of his grandfather clock! At the time of purchase, the whole terrace was condemned. Andy obtained both Planning Permission and a £1,000 Grant to convert the terrace into one dwelling, No 6, but conditions attached to both required the terrace to be virtually demolished. The existing ground floors had to be broken out and replaced as lower suspended floors and the roof raised to give more headroom, requiring the external walls to be raised, i.e. demolished and re-built! Ultimately, the internal party walls between the original 4 cottages were basically all that were left of the original terrace. Andy felt that all the conditions imposed meant the cottages lost a lot of their original character but if he didn’t agree to comply they would have been demolished. Andy also at the same time built an extension towards the Lane and perpendicular to the original terrace, centred on the position of the old doorway to No 8. This provided an integral garage, plus a new front door in the corner between the extension and the old No 6. Miss Mumford had a shop in the right hand side of No 49 before Mr Rushbrooke bought it for the dairy business in 1956. She went to live in the end-of-terrace No 50 High Street when she left No 49 High Street. To the rear, on the left, is an outbuilding, which was also there in 1960. It was originally built of clay batts, but these have largely been replaced by brick as the batts fell down! It housed a small cold store for the dairy in its front with garages behind. However, the front portion was knocked down by a delivery lorry soon after the Bowden’s moved in, and the front wall was moved back and a larger cold store built. An office was also added in the roof space. A baker’s bread oven was discovered in this building; it was removed by Frederick. To the rear, on the right, is another building. This was the Oddfellows Hall and was in two parts but the Bowdens demolished the front half and added a carport to the back end. Subsequently the remaining portion of the Hall was demolished because it was falling down, and further carports added. Aerial view of No 49 High St and large garden behind. To the rear, behind the buildings on the left and right, there was in 1960 a line of carports (timber frame with galvanised corrugated tin sheets) parallel to the High Street which was knocked down because of its condition. During this process, under the carports, the brick foundations were found of a line of cottages parallel to the High Street (Tudor, timber framed); the cottage at the Lane end of these was the original Green Man pub. (The existence of these cottages was later confirmed by Peter Jackson of Church St, whose father lived in one of the cottages when he, the father, was a young boy. Peter’s father was born in 1908). The adjacent photograph shows No 49 after all the above work was completed, with a large garden area at the back of the plot. 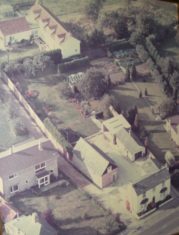 Andy sold most of this garden area with planning permission in 1989, but building of what became No 4 Green Man Lane was not until about 2008. In 1989 No 49 High St was sold to Sherriff & Tiplady (Quantity Surveyors); at this time No 49 owned the full length of Green Man Lane. It was sold at the end of 2007/beginning of 2008 to Hairs & Graces hairdresser’s business (who moved there from No 29 High Street) and is now painted white with “H & G” signage across the front. Hairs & Graces is in the right front, with offices in the left front and rear; upstairs there is a two-bedroom apartment. From andy’s deeds he found until 1918 the ownership of No 57 included the land occupied by Nos 51, 53 & 59 High Street, (previously occupied by Wallman family) and was part of the Manor of Tiptofts. All this land was, at a previous time, part of a farm; the buildings immediately to the right of No 57 were the farm’s cattle shed/barns and behind these was an open-fronted barn. This open-fronted barn was in poor repair in 1989; a further single storey building towards the northern boundary being added about 1992. About 2000 part of this added building was leased by the Royal Mail to use as a Sorting/Delivery Office; this continued until mid 2014, when it was used as a Bag Drop until late 2014. In 2012 the open-fronted barn was converted to a dwelling, being given the postal address of No 57A, but remaining within the ownership of No 57, sharing the same driveway. Mr & Mrs Topham owned No 57 High Street until 1989. It was called Lincoln house as George’s parents were from Lincoln. George Topham had been an engineer in Cambridge with his own garage but had moved to Harston and enjoyed rearing pigs there. (Eligh Northrop’s brother-in-law Arthur worked for Mr Topham helping with the pigs.) George’s wife was a civil servant working at Brooklands Avenue, the same time as Ed Burl whose wife ran the Post Office. The Tophams sold to Thompsons Coaches in about 1930 the land and cattle sheds which then became No 59. The cattle sheds were converted to garages and used by Thompson Coaches, Premier Travel Coach & Bus Co and then re-modelled in 1970 for Fletchers Cars. About 1990 they were demolished and rebuilt as it is now by Stocks Builders, becoming Lancaster Volvo then Lex Ford (1994?) then Tim Brinton Peugot and finally Subaru which vacated it in 2014. During the time of Premier Travel, there was a cottage called Castle Cottage half way down the plot on the left; Premier’s mechanic Mr Law lived here with his family. Andy worked here in the early 1960’s, aged about 15 mending all the punctures left at the end of the day and serving petrol- Cleveland petrol at the time for John Ives and Wally Truslove. Ron Bass had owned the garage early on, then Ives & Truslove, then Mills. Before taking over the garage John Ives had been in the RAF, getting an airframe qualification/ticket for welding aeroplane frames while Wally was some sort of engineer. They had then both worked for Fisons in their Airwork Services – spraying chemicals and had worked in Egypt. Wally’s brother ‘Curly’ lived in one of the Pest Houses (Fisons houses) and ended in in Management of Bond Helicopters at Bourn. The Harston garage sometimes did some paint spraying work for this Bourn organisation, Liz chapman’s husband Keith (who had been in the navy) doing the paint spraying both in the garage and at Bourn aircraft. David Deacon was also a mechanic there around 1961-2. John Ives’ wife Angela’s parents ran a pub in Comberton before retiring to Hurrell’s Row. The garage/filling station was originally in No 123 which was at that time a timber building on the corner of the High Street and what is now Sheepshead Lane; this had a much narrower frontage on the High Street than the BP station now occupies. No 127 was a private dwelling further north along the High Street, on the site of the present BP office/shop. Mr Mills bought No 127, demolished it, and expanded the garage/station into the space. This is the corrugated tin sheet “shed” on wheels which is in the back area of No 43 High Street – it does have a valid postal address! Mrs Johns rented this and lived there. She was followed by Mr Davis & Mrs Clark who lived there whilst No 7 Green Man Lane was built for them. Mr Davis Clark was the grandson (welder at Welding institute then at Fisons) of Mr Swann, who owned Nos 43 & 45 High Street and Victoria Cottages. Andy thinks that nobody has lived in No 45 since about the mid 1970’s. This was a row of 6 terraced cottages built perpendicular to the High Street on the land where No 7 Green Man Lane stands in 2014. The cottages fronted on to Queen Victoria Walk which was on the south side of the cottages, and backed on to Green Man Lane. The cottages had no drainage there and they got water from a standpipe. Mrs Burnett lived in the first cottage- she was a post lady. Andy remembers her cottage had sliding sash windows. Mrs Mallows lived in the second one- her husband would come from Hauxton. The cottages were eventually owned by Peggy & Vic Clarke (plumber); Peggy the daughter of Frank Swan who owned No 43 High St and the cottages until his death. In the early 1960s the Clarkes offered the cottages to Andy’s father for about £650- a bargain in those days, but he wasn’t interested. The cottages were then demolished to allow the building of No 7 Green Man Lane by the Clarkes. Mr Knight bought this plot from the owner of No 57 High Street (not Andy!) and built No 51 in about 1960; previously there had been a shed on the plot., Mr George Knight ran a grocery business here for a time (at same time working at Fisons- Mrs Knight being main shopkeeper), and then sold to Mr Walton, who ran a business supplying pre-packed architectural ironmongery. Mrs Walton still lives there (2017) with her two sons (Gordon & ?). No 53 High Street has always been one residence to Andrew’s knowledge, even though the building is very long, with space for a No No 55 High Street. In 1960 Mr Goode had the Post Office in the south end of No 53. The building’s front wall has been “faced” with Burwell White bricks. Andy’s mum was a concert pianist and they brought her music sheets and piano to Harston when they moved here after her death. They gave Nora Sellen the music sheets as Nora taught lessons and gave one of her students the piano. Nora’s son Eddie was a roadie for Paul McCartney’s band Wings. Colin Andrews and Martin Gambie helped Andy with the milk round. Martin was the son of Margaret Gambie, nee Thompson. Andy remembers delivering milk to two cottages along the lane leading to 2 Station Rd, where Margaret’s uncle?- Mr ‘Honky’ Thompson lived (a relation of Thompson’s Coaches). He lived in a cottage about 50 yards back from Station Rd which was demolished before the building of Nos 6, 8 & 10. These properties, together with Linden House (No 2 Station Rd), were built by Abert Hearn when he purchased the whole site in the 1960’s. Andrew suggests that the “hardstanding” still left in garden of No 10 was the foundation for Honky’s cottage. Harry Lawrance lived at No 7 Royston road in 1960 – Andy knows this because he and his dad Frederick lived with Harry for three weeks just before they moved into No 49 High Street! Harry was also a Special Constable at this time and one evening they all heard a loud bang as a car crashed into the Edward’s wall (11 Royston Rd) and Harry put on his uniform and went to investigate. Harry and his two brothers were the village blacksmiths at the smithy at what is now Nos 6 & 6A High Street, There were 3 forges in a semi-circle in the smithy, one for each brother. There was a lean-to on the left of the smithy. Mrs Joan Lawrance lived at what is now No 4 High Street (Forge Cottage) – there was no residence on the plots of the current Nos 6 & 6A. Photo PHS004.04 shows the pantile roof to the smithy to the left. Andy was not surprised by the movement of the front door shown on the different photos of No 4 – there was a lot of building work done at that building. Mr Albert Lawrance was Harry’s nephew, and the Head Teacher of Soham Village College. Mr Cox lived between the Lawrances and the Edwards in 1960 and every morning Andy saw him walk along Royston Road towards Granary Cottages with a wooden yolk over his shoulders with two buckets attached, presumably to get water. Many properties still didn’t have amenities then and every week a lorry came along the main road and people came out with buckets of sewage and tipped it into a trough on the back of the lorry, from where it would sink into a tank and be taken elsewhere. Andy remembered the truck drivers stopping at the end of the main road after collection to eat their sandwiches! John Pidduck and Robert Arbon were both very skilled carpenters who worked with the Willers and both sadly died of asbestosis possibly through sawing through asbestos in the early days. John did his apprenticeship at Rattee & Kett and told Andy of his first task which was to make a trestle . Not an easy task to get all the legs level and after he had sawn off much of the legs trying to get them even he was advised to abandon it! He lived in a white cottage in Church Street where his wife June still lives. Post 1960, there was an electrical retailer (Mr Butcher) on the right hand side of the drive alongside the Coach & Horses in the High Street. There was also an electrical shop at the end of Hurrell’s Row run by a Pole named Bruno Konsievicz?. He had worked for Pye during the war. He used to play golf with Andy’s father. At the top of chapel Lane was the Northrop’s paper shop run by John’s father Jack. The Public Byway running north off London Road to Hauxton was known as Donkey Lane until the point where the hard surfacing starts, when it becomes The Lane in Hauxton. Queens Close was built in the 1950’s; it was the site of an antiaircraft battery during the WWII. No 50 High Street was the end-of-terrace for Nos 50 to 42; it was demolished to allow the building of the detached bungalow occupying the plot in 2014, causing No 48 to become the end-of-terrace! The frontage incorporating the Gas Governor to the north of No 56 High Street was the driveway entrance to Lime Tree Farm. Lime Tree Farm was owned by Miss Collins; she ran a riding stables from there and came from a family in Saffron Walden noted for rosettes won in horse world carriage horses? Andrew remembers that when the council cut the grass verges she would go round afterwards with her fawn coloured old Morris Oxford truck and collect it on the truck which resembled a large moving haystack – feed for her ponies. She sold most of her land for The Limes housing estate but could not get planning permission for the balance of the land, which became the area now occupied by the Recreation Ground, Community Orchard and Conservation Area. David Stocker’s father also sold used cars from No 1 High Street. Mr Symons lived in 3 Royston Rd before Mr Cairns- eye surgeon. Trevor Knight was a building inspector for South Cambs/Chesterton RDC and was also a keen cricketer, as was his father Norman who was an umpire. He lived in New Road. Bill Ives was a very good cricketer, but sadly died of a heart attack while working on a construction job in Button End making pre-cast window sills and lintels. Tony Gatward also had a business in Button end making tiles- Camtiles? The shed they were produced in he later converted to the house he now lives in. Tony originally kept lots of pigs, as did his dad in the High Street until about 1961. In 1960s Ed Burl had a shop run in one downstairs room with living quarters upstairs. His wife ran the Post Office from there after it closed down at 53 High St. His daughter married a Stittle and they lived in a house behind the Post Office. Members of the Stittle family also lived in the left side cottage of Fleece Cottages in Button End while Bert Northrop, with his second wife Nellie, lived in the right hand cottage. Michael Rivers and family live in the bungalow to the right. Michael was a Co-op insurance man. Jill chapman, who lived at 15 Church Street married Paul Saunders. He was a Postie until 6 years ago and she worked at Harston School. Her brother-in-law Michael Pevley was a self-employed builder and Paul worked with him. The Fuller family lived behind No 29 High Street and owned the shop. When Andy first moved here the Ware family ran a General Store in the shop with Mr Collins running a paint shop to the right and Miss Jackson a hairdressers to the left. If you went there you would get a ‘pudding basin’ cut. This page was added on 25/09/2017.